Sure Start Children’s Centres are open to all families with children under 5, offering a range of activities and services. We can offer parents, carers and families support and information on a whole range of childcare related issues. 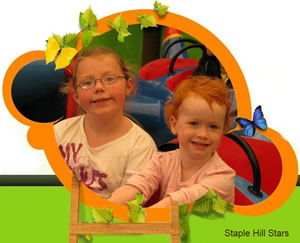 Stay & Play aims to support parents in their role and provide quality play and learning opportunities for young children. We encourage parents to play alongside their children in order to help them grow and develop. An opportunity to meet other families , to make new friends and to access advice, guid-ance and support around being a parent/carer. Offering full time childcare for children aged 4-14 during school holidays. We are local mum’s who live within the community of Staple Hill, who wanted to create a special environment and a unique setting. Our Pre-School is small, friendly, flexible and supportive to the needs of families in our community. Our team is made up of experienced staff who have a wide range of qualifications and experience in childcare. Each child is allocated a key worker who works closely with them and their family.